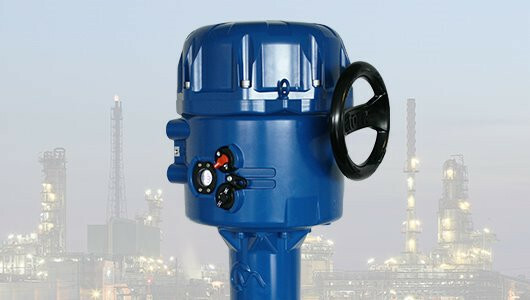 The new actuator is capable of a maximum 4,500 lbf (20 kN) seating thrust. The new sizes increase the CMA range modulating thrust performance to 3,000 lbf (13 kN) with a 114.3 mm (4.5”) stroke length for the automation of larger valves with higher pressure ratings. The combined performance of the CMA and the larger CVA ranges enables Rotork’s innovative electrical control valve actuation technologies to be applied to process control applications of virtually any size and description. CMAs are robust enough to handle extreme temperature swings, corrosive environments and are also available for explosionproof areas. The CML-1500 and CML-3000 models, including those with hazardous area approvals, are watertight to IP68 for temporary submersion (7 metres, 72 hours). The optional Reserve Power Pack (RPP) uses supercapacitors to provide the actuator with enough stored energy to perform predetermined action on mains power failure, such as moving to the fully closed position, fully open position or anywhere in between. Manual operation is available as standard. The cost-effective electric solution is suitable for a wide variety of applications found in sectors such as power generation, chemicals, petrochemicals and the majority of other process industries. The new sizes are ideal for linear valve control with modulating duty, generally in remote locations, such as oil pipelines and remote gas extraction stations where power supplies are limited. Single-phase or DC electrical power is all that is required for control valve actuation, saving the installation and on-going costs associated with instrument air supplies. Simple cabling replaces cumbersome lines and hoses, eliminating freezing and leaking problems. The CMA is a low power consumption solution (less than 1 Watt at standby) for automation in established or remote installations such as oil installations and offshore facilities where there are pneumatic limitations. The design allows for solar powered and battery back-up supplies in remote locations where electric energy consumption is a concern and power is often provided through solar collection for the operation of remote automated critical systems such as wellheads. The new sizes retain all the features and benefits of the established CMA range of compact modulating actuators, providing continuous modulation with 0.1% accuracy for the most demanding process control applications.